The exciting news is that I’m going to Hawaii on Friday. Among the rest of the pre-vacation stress — leaving work projects in a good place, finding a bathing suit, and trying to whip myself into bathing suit shape — I have been trying to perfectly plan our refrigerator contents so that they are at zero (excluding condiments) at the exact moment we leave for the airport. It is so much harder than you might expect! First of all, this process has to start at least a week before departure, which is hopefully the last time you do a real shop. I did all the right things — planned meals, made sure I wasn’t doubling up on anything I already had at home, and then got home and cooked a few pots of food for the week. So at T-7, I felt like I was in pretty good shape to leave for my trip. The first snafu came over the weekend, however, when I threw an engagement party for a good friend. Though we tried to keep the excessive platters to a minimum, and I was adamant about sending everyone away with extra food, I still wound up taking home some of the surplus. Cheese, no less, which is not all that helpful to the last minute get-in-shape effort, mind you! Fortunately, my boyfriend is quite the cheese lover, so I felt he could take that one for the team. Then, in order to thank us for the party, the happy couple gave us a bunch of fresh herbs and sauces that they had cooked up. Oy. The next hurdle came when I went to water my garden. 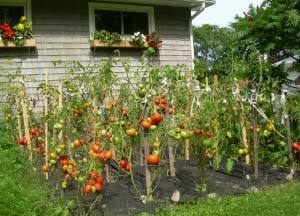 When did all these tomatoes get ripe? I swear just three days prior there were no cucumbers or zucchini, and I guarantee all the melons were green. And yet there I stood forced to harvest this bounty that I worked so hard to grow. The week’s meal plan had been thwarted again. So now, here I am, T-3. I have resisted the temptation to order take out the last few exhausting days. I have concocted some strange meals with new and unusual mixes of ingredients. And yet, more tomatoes are getting ripe on the vine and the pots-o-goodness that I prepared at the beginning of the week are still waiting to be eaten. Fear not, though, as I have a plan. Lunch will be brought by all members of the household (unfortunately for this mission, there are only two of us). Priority will be given to non-freezable items. Strange foods will be eaten for breakfast, as cereal can last until we return. One final meal that combines the most ridiculous of items will be eaten. And thankfully, there is always the freezer, a good friend to anyone facing the pre-vacation food planning predicament — especially since when I return, I’ll be glad to say aloha to a frozen meal waiting for me since my refrigerator will be perfectly, intentionally empty. How Do You Empty Your Refrigerator Before Your Vacation? Do you mindfully plan out your meals before going away to empty your refrigerator? What other solutions do you find are helpful in preventing food waste before a big trip? You might also like Dana Gunders’s Report, Wasted: How America Is Losing Up to 40 Percent of Its Food from Farm to Fork to Landfill. LINK HERE for a free PDF copy of the report. Dana Gunders is a Staff Scientist at the Natural Resources Defense Council (NRDC). She works on market and policy oriented initiatives to promote sustainability throughout food systems and supply chains. 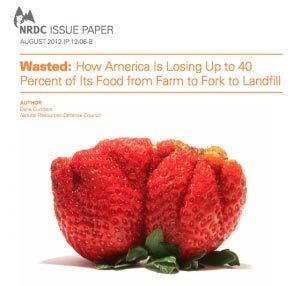 She leads NRDC’s work on reducing food waste and is the author of a widely distributed report Wasted: How America is Losing Up to 40% of Its Food from Farm to Fork to Landfill. 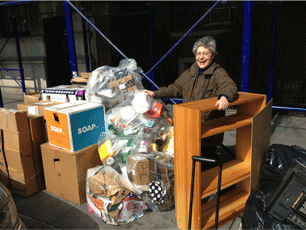 Her work on food waste has been featured by CNN, CNBC, The New York Times, NPR, and many other outlets. In addition to working on reducing the amount of wasted food, Dana works on improving food sourcing of individual companies and as part of the Steering Committee for the Stewardship Index for Specialty Crops and a participant in the Sustainability Consortium. She holds a B.S. and M.S. in Earth Systems from Stanford University. Check out Dana's blog at https://www.nrdc.org/experts/dana-gunders, or read more of her stories HERE. I love this, Dana! I identify with this because it’s just what I do. In those cases where I don’t make a perfect intersection between leaving and emptying the fridge, I pack a banana or two — whatever’s left — in my bag and try to eat it on the train or whatever while I’m heading out of town. And from time to time, I intentionally try to run down the pantry, just so that things don’t spoil by getting old. You, too? Subject of your next post, perhaps? Hope the vacation is going well! 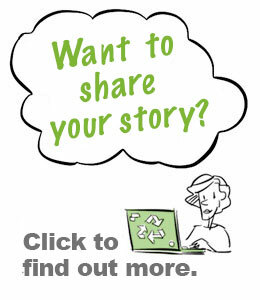 Dana – Big fan of your NRDC report, as you can see from my own food waste posts. I’m not a frequent traveler, but definitely did some similar purchase and consumption “timing” before our last trip (e.g., just enough milk for breakfast before the flight). And, like Jacquie, we took the bananas and cherries with us for the plane. I find mindful planning useful on a day-to-day basis as well, e.g., buying bananas in varying stages of ripeness so I’m not stuck with 5 very yellow ones that need to be eaten immediately, or 5 very green ones that I can’t eat yet. Not always successful. Sometimes I guess wrong about how much bread we need, or how fast the peaches will ripen. Fortunately most of my mistakes can be frozen or thawed out (a few slices at a time) or eaten (eventually). Having just traveled recently myself, I can say I can definitely relate to aiming for that perfect timing of just eating all your perishables right before you get on the plane and go! I think the biggest problem for me is that I am an avid fruit eater, so not having fruit in the house really isn’t an option for me. But one of the best things I found to do is to find dishes that use up a lot of different ingredients! My solution for the fruit is to make a smoothie! Not only does it use up my supply before it goes bad, but it requires milk and yogurt products. Two other items I struggle with using entirely before I travel. Mixing these all together gives me a great and healthy alternative to just throwing these items out. Similarly, when I would go on family vacations when I was younger, my mother would take old bread items and vegetables and make a casserole (using the bread as a base or for breadcrumb toppings) that can be frozen until you return from your travels. Like you mentioned Dana, it would provide a meal ready to go for when you return! But the best solution is really to try and plan accordingly for your day to day meals so as to not have to find ways around wasting food products as much as possible. Dana – Just read an article on MotherJones.com about the new NRDC report which you helped produce (“The Dating Game: How Confusing Food Date Labels Lead to Food Waste in America”). 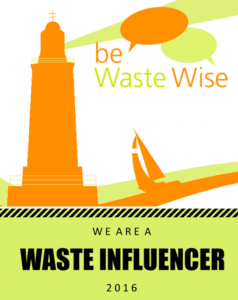 It should be of interest to readers of this post (and all Waste Watchers). Thanks for mentioning that report, Fredrica, and raising the issue of sell by dates. Very important issue. I must confess to using sell by dates as a more or less “buy by dates”. I check out the milk containers to find the fresher ones, thus potentially contributing to leaving older mil behind that might go to… waste! Yikes! We all can do our part. Emptying the fridge before you go on vacation is a really important thing to do. It’s also really necessary before one goes on a business trip. I wonder if businesses realize how much food their employees waste every time they are called out of town, especially last minute when there’s little time to ‘count down’ to the trip. Good point, Jacquie. It would be amazing if offices offered a free-box for food, like free-boxes are offered in some communities. I remember when I lived in a co-op in Amsterdam, my flatmates and I had a similar box. We were often traveling on weekends, so we left food in one specific shelf of the fridge that was available for anyone to use. This reduced the amount of food going to waste and allowed us to get creative with new ingredients in the kitchen. Dana, thanks for the great post. I often find that some of the most innovative of meals come from the drive of not wanting to see food go to waste. One of my favorite memories from my childhood was when everyone in my family would choose an ingredient from the refrigerator or pantry, presenting them to my dad and watching how he would combine them into something delicious. When I was a kid I did not realize that my dad was actively reducing our family’s food waste — not just making a game for his kids to get involved in the kitchen. Now that I am a passionate waste watcher (and wallet watcher) I’ve been using this trick with my roommates. Thanks again for the thought-provoking post. Without a doubt, my friends and I have had that infamous last supper with the most bizarre collection of foods before we head out of town to clean out the fridge. The most random foods are always consumed that day: from chocolate pancakes, a 7 egg omelet, ground turkey chili, to carrot stew. You name it, we’ve tried it. That last minute frantic mad dash is as delicious as it is stressful. This article is definitely getting bookmarked and you other commenters have some noteworthy advice and suggestions. Maybe from now one every out of town trip will no longer start with an uneasy stomach. Growing up, I was a huge fan of the tv show Iron Chef – I loved watching them struggle to utilize funky ingredients to make good food. Lately I have been traveling a lot and I find myself subjecting my roommates to my Iron Chef dinner creations, trying to empty the fridge before I go out of town. So far, my best trick is to make a few different types of soup using as many fridge ingredients as possible. Soups freeze really well and are a great thing to have stockpiled for when you need something easy to eat for dinner or lunch. Plus, they seem like they never go bad!